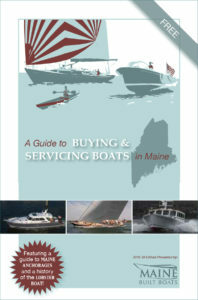 The 2018-19 edition of the annual Maine Built Boats Guide to Buying & Servicing Boats in Maine has been published. Digital versions of the annual guide are available free for download on the Maine Built Boats website. Printed copies of the MBB guide are available free at boatyards, marinas, retail outlets, and boat shows around northern New England. Thanks to all our members, associates and advertisers who help us publish this important guide annually.